There are our newest generation of CCFL; they doesn't just produce a higher brightness and contrast, they are also made by precise precision color match. After the backlight replacement, the image should look brighter and clearer. Note: Replacing with a poor quality CCFL may cause a greenish, bluish or reddish hue after the backlight lamp replacement. High Color Rendering (Triband Phosphors Applied). For other type of lamp, please visit our CCFL Backlight page. 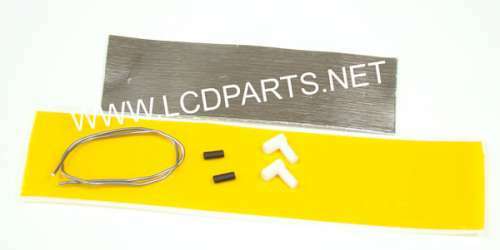 This kit comes with 6 inch of aluminum foil conductive tape and 12 inch of Hi Temp reflective thermal insulting Tape, two silicon end caps, two heat shrinking tubes and 6 inch of wire solder. This is a MUST have kit if you are replacing lamp on the Laptop/Notebook screen. This aluminum foil condctive tape is used to meet a variety of EMI/RFI shielding applications.